Artificial Intelligence is a part of our daily lives through the use of technologies like virtual assistants such as Cortana, smart homes, and automated customer service. We also have the power of the Internet of Things technology in organizations. How can we put them together for success in our organizations? Businesses are running the Red Queen's race not just to win, but to survive in a world where Artificial Intelligence and IoT are becoming the present as well as the future of technology, and ideas are developing into reality at accelerated rates. How can you help your company to evolve, adapt and succeed using IoT and Artificial Intelligence to stay at the forefront of the competition, and win the Red Queen's Race? What are the potential issues, complications, and benefits that the future of technology could bring to us and our organisations, right now? 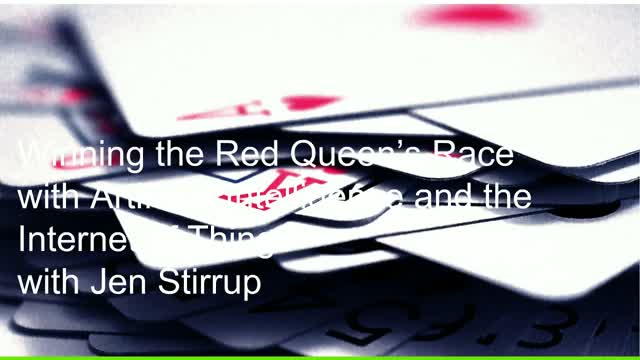 In this session, Jen Stirrup will explain the quick wins to win the Red Queen's Race in AI and IoT to help you and your organization to win the Red Queen's race.